This article is about the Game & Watch game. For the Game & Wario microgame based on the game, see Ball (G&W). For the item from Mario's Time Machine, see Ball (item). Ball is the very first game of the Game & Watch series and was released as a part of the Silver series on April 28, 1980. It is also an unlockable minigame in Game & Watch Gallery 2. Depending on the publisher, the game has gone by other names as well, including Juggle and Toss-Up. 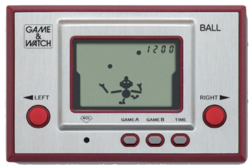 This Game & Watch was later reworked into the Mario-themed Mario the Juggler; this remake was the last Game & Watch title produced (not counting Parachute × Octopus released nearly 10 years later). The goal is to juggle the balls as long as the player can. If one ball breaks, it is Game Over. Game A has two balls (one point per catch), while Game B uses three balls to juggle with (10 points per catch). This has, unlike the other Game & Watch games, one chance to play, before a Game Over. Ball is one of the games in the Gallery Corner in the original Game & Watch Gallery, and it appears as a microgame called Game & Watch Toss Up in WarioWare: Touched! and another called Ball in Game & Wario. It was once available at Club Nintendo for 1,200 coins. 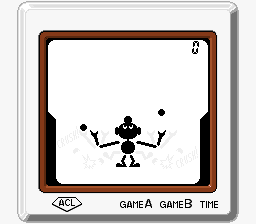 In Game & Watch Gallery 2, the player starts out with only the Classic version (unlike most Game & Watch games in the Game & Watch Gallery series). In order to unlock the Modern version, they would first have to either obtain five stars on both modes in the Classic version or possess a star count of 25 or more. Easy Mode seems to be like Game A, while Hard Mode is Game B. The player starts out playing as a Light Blue Yoshi, but as they collect more stars, they can later play as Mario, then as Wario, and finally as Bowser (who is represented by a K for Koopa, as in King Koopa), each more difficult than the last. The first mode has the Yoshi juggling Yoshi Eggs. The Mario mode has the player juggling a Star, a Super Mushroom, and a Heart, actually just like Mario the Juggler, but with the Super Mushroom added. These items have varying arcs of flight as opposed to the fixed patterns of the eggs. The Heart is also only worth two points as opposed to three. Wario's mode gives the player the same Heart, a Spiked Ball, and a Wanderin' Goom to juggle. The objects have varying arcs of flight, and the Goom will occasionally fly off-screen. Bowser's mode features a Koopa Shell, a Boo, and a Goomba to keep aloft. Like the Goom, the Goomba and shell will sometimes fly off-screen. The Boo will also occasionally stop while traveling across its arc. Like the Heart, the Goomba and shell are only worth two points apiece. The four variants of the Modern version of Ball all have Bob-ombs that sometimes fly down from the sky. If a bomb hits one of the paddles, it will cause a Game Over too. At 100 points for the Yoshi, 200 points for Mario, 300 points for Wario, and 400 points for Bowser, coins will rain from the sky. Touching the coins with the paddles rewards the player with bonus points. By getting all of the coins, the player receives a 20-point bonus as well. Unlike in the Classic version, music is featured, with the tempo changing depending on the speed of the game. This game can also be played in Game & Watch Gallery 2, along with the Game Boy Camera, with the player's face, instead of the juggler's. This game is the only Game & Watch game remade after the Game Boy was released. One of the tips for this game is inaccurate; Toad tells the player they have to catch the characters (the characters being Bob-ombs), and avoid the coins when it is actually the other way around. This may have been an error in translation; the tip is accurate in the Japanese version. In addition to the four character monogram icons that are actually used in the game, the mode select screen for Ball also has a "P" icon in its tileset, positioned before the "Y" icon. This may imply that during the development of Game & Watch Gallery 2, Princess Peach was planned to be one of the playable characters in Modern Mode, and have a version even easier than Yoshi's. It is also known that Peach's version of Ball was going to have her juggle cookies like those seen in Yoshi's Cookie. This page was last edited on April 20, 2019, at 10:03.